Whether your course is under constant water use restrictions or you have plenty of water available, the real challenge is getting water to go where you need it. The amount of water you apply doesn’t matter if your turf can’t access it. Dispatch increases the penetration and infiltration of irrigation or rainfall, making it more readily available for plant uptake. 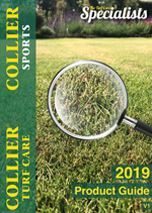 Because Dispatch delivers water more efficiently into the soil, photosynthesis and other turf metabolic functions can be maintained with less water. The result is increased turf performance even under heat and moisture stress, and more dependable plant growth and playability coursewide. Dispatch is specifically engineered to enhance water penetration “wall-to-wall.” This patented, synergistic blend of block copolymer and alkyl polyglycoside surfactants gives you better water penetration, improving irrigation efficiency coursewide without great expense or major capital inputs. Reduces surface run-off by as much as 19.2% on slopes! This reduces the loss of costly water soluble chemicals as well as water! Apply a minimum of 2 liters/hectare to increase overall turf quality while decreasing the amount of money and effort needed to get it!